A recent (April 21, 2010) post on Leeds Tapestry* (http://leedstapestry.blogspot.com/2010/04/legal-sector-leeds-coat-of-arms.html), discusses one panel (of sixteen) of a larger community project to which several artists are contributing. 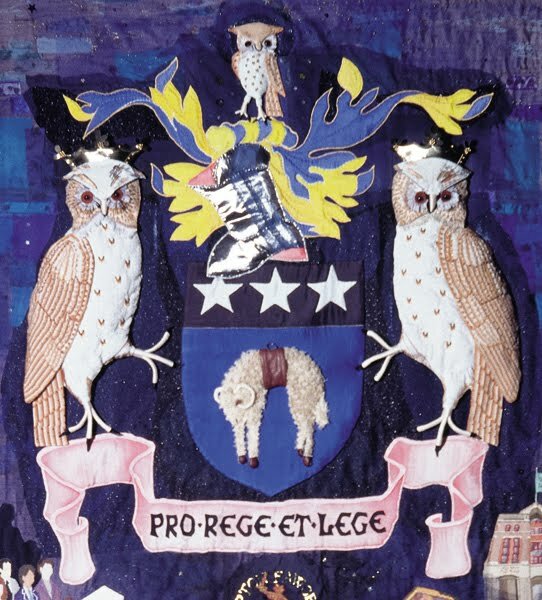 The panel that is the subject of the April 21 post is the achievement of arms of the city of Leeds, Yorkshire, England. The three owls were embroidered by Audrey Gabbitas in a variety of techniques: the wings are canvaswork; the bodies hand embroidered and padded; the feet made of wire and wrapped with perle thread; and the crowns are gold leather. The lamb and mullets (stars) were done by Colleen Nicoll; the helmet and mantling by Anne Darch were all appliqued. Kate Russell and Sue Hodgson hand embroidered the motto scroll. Isn't it great to see people involved in creating heraldry? Be sure to drop by Leeds Tapestry for a greater discussion of the arms and the origins of the various elements which make it up. *Leeds Tapestry documents a community embroidery conceived by Kate Russell to celebrate the life and times of this West Yorkshire city at the millennium. The sixteen completed panels are on display at the Central Library in Leeds. Glad to see you liked the heraldry on the Tapestry. We have a few more Coats of Arms there which will be shown eventually. Interesting that they're once again shown in textile techniques.